NAD unveils new amps and headphones at CES 2018 | What Hi-Fi? Two thorough refreshes of existing products plus a brand-new design make up NAD's Vegas trio. NAD has swelled the ranks of new headphones at CES, and launched a couple of stereo amps while it's about it. The D 3020 V2 (above) is a keenly priced integrated amplifier, while the M22 V2 is a much pricier power amp. The headphones - VISO MP70 - are a wireless, noise-cancelling, on-ear affair and are priced at $399. UK pricing is yet to be confirmed, but we'd be surprised if it didn't involve the numbers '3, 9, 9'. 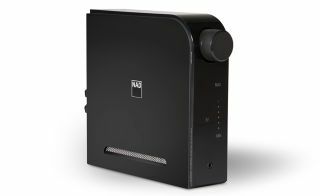 VISO MP70 is NAD's first wireless design and, at 320g, it's relatively light for a full-size, active offering. 'Tri-mode' operation means the HP70s can be used wirelessly with noise-cancellation engaged, with noise-cancellation off, or passively via the supplied 3.5mm cable. Wireless connection is via aptX Bluetooth HD, and battery life is claimed to be 15 hours when all power-sapping modes are deployed. Part of NAD's 'Masters Series', the M22 V2 is a stereo power amplifier of big numbers, from power output to price. It'll set you back £2800 - the same as the M22 it replaces. Power, though, is up 20 per cent over the outgoing model, at 300 watts per channel. The V2 has a bridging mode that turns it into a 900 watt monoblock. NAD is claiming disortion "below measurement", "almost non-existent" noise and "unconditional stability" with any loudspeaker. If this sounds like your kind of thing, the M22 V2 goes on sale next month. The D 3020 V2 stereo integrated amplifer is a replacement for the 2013's trend-setting D 3020. It adds a moving magnet phono stage to the original's specification, along with stereo pre-outs, which join stereo RCA analogue inputs alongside optical and coxial digital sockets. Wireless connectivity is achievable via aptX Bluetooth, and all digital inputs lead to a 24bit/192kHz DAC. Power is unchanged, at 30 watts per channel, and the D 3020 V2 will be priced at £399.